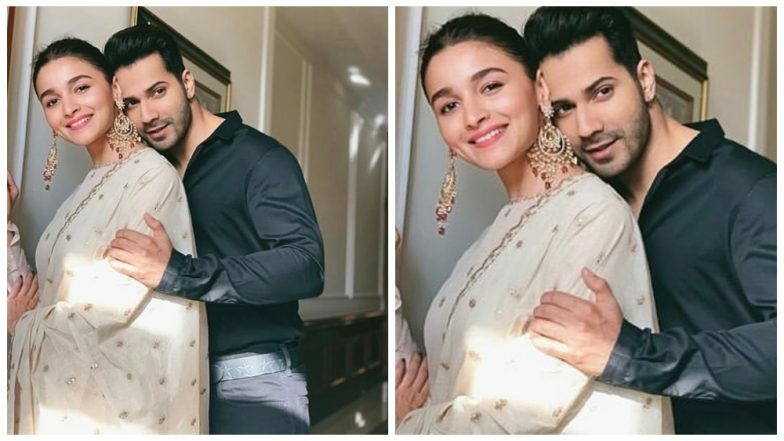 We know that your social media feed must be already filled with Alia Bhatt and Varun Dhawan's pictures, thanks to Kalank! The duo has been on a spree to promote their upcoming film under Dharma Productions banner, wearing classy traditional outfits everyday. Once again, they posted picture from their photoshoot but this one has all the attention of the fans! Why you ask? Look at the crackling chemistry oozing out of that picture. Fans were almost convinced that they are the real-life pair and that they should get married ASAP! Ranbir Kapoor, beware! Alia Bhatt Took Inspiration From Fawad Khan Starrer Pakistani Daily Soap Zindagi Gulzar Hai for Her Character in Kalank. So, Alia was seen in an off-white and gold outfit, looking gorgeous. She completed this look by using those statement earrings. Then there was Varun, holding her, looking dapper in a glamorous plain black shirt. There, the couple had all the fans talking about them. The fans started commenting calling them 'best friends goals' and more. However, most of them gave a free advice to Alia and Varun to get married to each other as they look the best! Some even compared them to Shah Rukh Khan and Kajol. Enough of words, let the picture do the talking. Now speaking a bit about their film, it is an Abhishek Varman flick. They will be sharing the space with other A-listers like Madhuri Dixit, Sanjay Dutt, Aditya Roy Kapur and Sonakshi Sinha in the lead. About their personal life, it is an open secret that Alia is dating Ranbir Kapoor while Varun Dhawan might soon get hitched to his long-time girlfriend, Natasha Dalal. Clearly, there is no possible 'marriage' happening of these two but yes, you can vouch for a cute love story of them in the years ahead.